In December 2012, as a kick-off to the Federal Reserve System's centennial, the Federal Reserve Bank of Cleveland asked leading monetary historians and macroeconomic economists to address current and recurring economic concerns that confront central banks from a historical perspective. The resulting papers, published in this volume, cover a wide range of issues, including the meaning of central-bank independence, the role of communications and rules in fostering credibility, the evolution of the lender-of-last-resort function, the mechanism through which banks transmit economic shocks, and prospects for a European monetary union. A retrospective on the Federal Reserve, this book contains essays by some of the world's most prominent financial historians and provides a thorough overview of the evolution of the monetary standard over the past two centuries. Offering historical context as a complement to economic theory and empiricism, these papers investigate how financial infrastructure shapes economic outcomes through comparisons of Canada and the United States. 1. Introduction: context and content Owen Humpage; 2. The uses and misuses of economic history Barry Eichengreen; 3. How and why the Fed must change in its second century Allan H. Meltzer; 4. The lender of last resort: lessons from the Fed's first 100 years Mark A. Carlson and David C. Wheelock; 5. Close but not a central bank: the New York Clearing House and issues of Clearing House loan certificates Jon Moen and Ellis Tallman; 6. Central-bank independence: can it survive a crisis? Forrest Capie and Geoffrey Wood; 7. Politics on the road to the US monetary union Peter L. Rousseau; 8. US precedents for Europe Harold James; 9. The limits of bimetallism Christopher M. Meissner; 10. The reserve pyramid and interbank contagion during the Great Depression Kris Mitchener and Gary Richardson; 11. Would large-scale asset purchases have helped the 1930s? An investigation of the responsiveness of bond yields from the 1930s to changes in debt levels John Landon-Lane; 12. A tale of two countries and two booms - Canada and the United States in the 1920s and the 2000s: the roles of monetary and financial stability policies Ehsan U. Choudhri and Lawrence L. Schembri; 13. It is history, but it's no accident: differences in residential mortgage markets in Canada and the United States Angela Redish; 14. Monetary regimes and policy on a global scale: the oeuvre of Michael D. Bordo Hugh Rockoff and Eugene N. White; 15. Reflections on the history and future of central banking Michael D. Bordo. 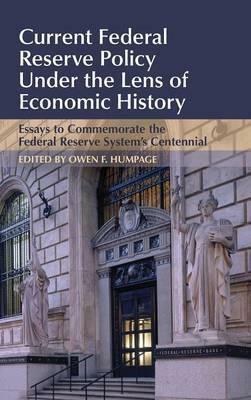 Owen Humpage is a senior economic advisor in the research department at the Federal Reserve Bank of Cleveland. His research has been published in the International Journal of Central Banking, the International Journal of Finance and Economics, the Journal of International Financial Markets, Institutions and Money, and the Journal of Money, Credit and Banking. Dr Humpage has taught economics at Oberlin College and Case Western Reserve University.